Last year I read several posts by bloggers I admire encouraging people to use the cloth napkins and burn the good candles—in other words, stop waiting for some vague perfect or special moment and enjoy what we have. There’s nothing to be gained from locking the nice dishes in the buffet or drinking from paper cups when crystal is available. I loved and embraced that idea. Sometimes it felt kind of indulgent, but the money was already spent (or the gifts already given), so the only way to make them worth the money was to use them. Enjoy them. So I did. And then I expanded that concept—I wanted only the best food. When servers delivered incorrectly prepared meals, I got huffy. I complained about inefficient service. I sulked when things didn’t go my way. I bought clothes because I read that you should love everything in your closet—if it didn’t make you happy, you should get rid of it. I drank better wines and only a certain kind of coffee. And so on. And, truly, I’ve never felt less content. This ugly feeling of dissatisfaction with anything less than perfect pervaded my internal world, as well. I started comparing myself to others. Instead of rejoicing for writers who experienced success, I felt cheated. I am unhappy with my weight, so I disliked those who were smaller and healthier and prettier. I became all-too-aware of the loose skin and crinkly lines under my eyes—and the lack of it on those who were younger. I started seeing all that was imperfect about me, about my life, and I felt sad. Insecure. As though I were a failure. I’ve had a lot of good things happen in the last year. I have a wonderful life, a loving family, a huge network of friends, a career I love (actually, two), and nothing in the world to complain about. I released a book, got good reviews, and wrote another one. So why was I so discontent? Because I took something that could have been good… and then went too far. This is not what those articles suggested. They were talking about living life fully—embracing the moment, giving thanks for our blessings. If I have nice things (possessions, relationships, opportunities), should I appreciate them? Of course. But I can’t let that turn into feelings of not-enough, or of wanting more. I don’t need more to be happy. I need less. Less of me, at least. Less desire to single-handedly control the outcome of a situation. Fewer attempts to single-handedly fix things. Less of a conviction that I am capable. A diminished belief that I “deserve”, well, anything. What do I need more of? God. More time with Him. More knowledge about Him and His love and His teachings. More reliance. More dependence. More trust. More hope. Because what I know—what I’ve always known, but temporarily lost sight of—is that I can’t find God when I insist on having control. There’s no room for Him if I think I can do everything myself. The sad truth is that, no matter how much I try to do it all, I can’t. No matter how capable I think I am, I will always have limitations. The more I look at myself, the more I insist on appreciating the nicer things or noticing when others have more than I do, the less I see God. And the more flawed and incompetent and dissatisfied and unhappy I will feel. God is more than enough. He really is. I know this in my heart, but my head is having trouble remembering. So while I don’t typically make new year’s resolutions, I am setting a goal for myself: I’m going to try to believe that. I’m going to remind myself, every time I appreciate something good or beautiful in my life, to give thanks. To gratefully accept what was given but not actively pursue more. I’m going to send up prayers of thanksgiving every time I hear of someone else’s achievements and opportunities. I am going to think about what I have to give to the people I come into contact with, not how others can help me. And I am going to surrender control. I will trust God to provide. To open doors. To navigate tricky paths. To improve impossible situations. To stop believing I need or deserve anything other than what I already have. 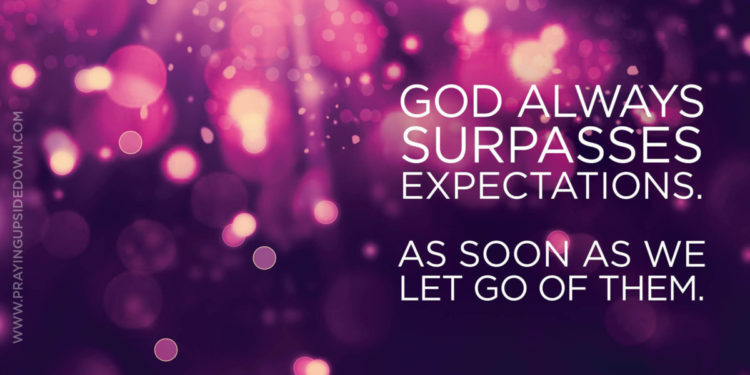 Because God always surpasses expectations. As soon as we let go of them. Finally, believers, whatever is true, whatever is honorable and worthy of respect, whatever is right and confirmed by God’s word, whatever is pure and wholesome, whatever is lovely and brings peace, whatever is admirable and of good repute; if there is any excellence, if there is anything worthy of praise, think continually on these things [center your mind on them, and implant them in your heart]. The things which you have learned and received and heard and seen in me, practice these things [in daily life], and the God [who is the source] of peace and well-being will be with you. I get it….I really do! Thank you so much for writing this, Kelly. I find myself doing the same; especially when it comes to my own body image and looks. Today I was even comparing my boring humdrum personality (as I viewed it) against a friend’s sparkling wit and feisty energy (she was entertaining her husband, and all around her :D) and going straight to feeling that my own husband must be bored with me and wishing he could move on. Wow. Could the comparison game get any more pitiful? Yet…I do seem to be in a season of chronic fatigue and lifelessness, and don’t see anyway back to the “sparkle” that God gave me – maybe different to hers, but my own. Nevertheless, this writing about comparing and dissatisfaction was timely, and I do appreciate you writing what God laid on your heart. I’ve been amazed how many people have connected to this post. Praying we can both — well, ALL of us — find that sparkle again!